Map of Franks' Peoria City Directory. This is an 1893 D. B. Allen city map or plan of Peoria, Illinois. Oriented toward the northwest, the map depicts the city from just north of the township line to Lake Peoria and the Illinois River and from South Peoria to Springdale Cemetery and the Illinois State Fair Grounds. Meticulously detailed, each block, both inside and outside the city limits (which are indicated by a thick orange line), are individually numbered. Every street is labeled, along with numerous companies, government buildings, and parks. Several properties outside the city limits are labeled using the owner's last name. Railroad lines, such as the Indiana, Bloomington, and Western Railroad, the Central Iowa Railroad, and the Rock Island and Peoria Railroad, are illustrated along Lake Peoria and the Illinois River. A street index is situated in the upper left corner of the map. The whole is framed by numerous advertisements for local businesses. One such advertisement promotes an enterprise that states that it can guarantee land titles that an individual is looking to purchase or use as collateral on a mortgage. Others advertise a patent and trade mark law office, Illinois coal, and a 'practical aeronaut'. 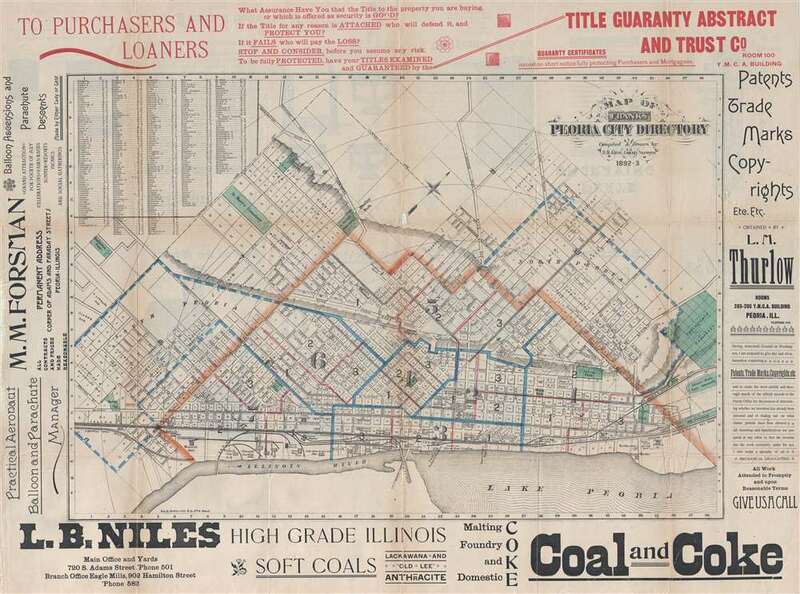 This map was compiled and drawn by D. B. Allen, County Surveyor for Franks' Peoria City Directory and published in 1893. Good. Backed on archival tissue. Slight loss along center fold line. Text on verso.